February | 2014 | YesBiscuit! When I last wrote about the Saginaw Co pound in MI, it was to praise the local advocates who stood up for the animals being neglected at the pound, even after then-director Val McCullough instituted retaliatory policy changes in an attempt to stifle their efforts. That was in August 2012. Ms. McCullough quit in the middle of the ensuing investigation and the county hired Kevin Wilken to replace her in November 2012. His leadership was fraught with controversy as well. In December 2013, Kevin Wilken was escorted from the pound by members of the county sheriff’s office. The county declined to comment on the reason for his removal except to clarify he had been placed on leave with pay. “During the operational assessment and state’s investigation, the county became concerned that several animals under the care of SCACC may not have received proper palliative care for their injuries or illnesses,” the release states. The Michigan Department of Agriculture and Rural Development has since notified the county that they face a hearing regarding the allegations of wrongdoing on March 7. “Specifically, the Saginaw County Animal Care failed to follow statutory requirements, and recommended and accepted good practices in the care of shelter animals including but not limited to proper holding, proper sanitation, adequate housing, proper handling of perishable food and proper disposal of dead animals,” the notice states. One dog was allegedly housed in a kennel in a state of disrepair which allowed a neighboring dog to injure him. The injured dog was allegedly left to needlessly suffer and later ordered killed by Kevin Wilken. More than 100 animals were allegedly killed before their state mandated holding periods had expired. Pet food was allegedly improperly store and infested with insects. No charges have been brought against Kevin Wilken. He remains on paid leave. An ACO has been running the pound in his absence. “Forsaken No More” is a paper on Pitbull facts by animal advocate Aubrie Kavanaugh. It may be useful to other shelter reform advocates who are battling Pitbull stereotypes and myths in their own communities. A boy in a rural area of the Philippines wants to open an animal shelter when he grows up. He’s putting a downpayment on the effort now. Eighteen cats were treated to a $35,000 home renovation by their owner in CA. A woman in Germany allowed her horse to come inside the house during a recent bout of severe weather. He liked it. 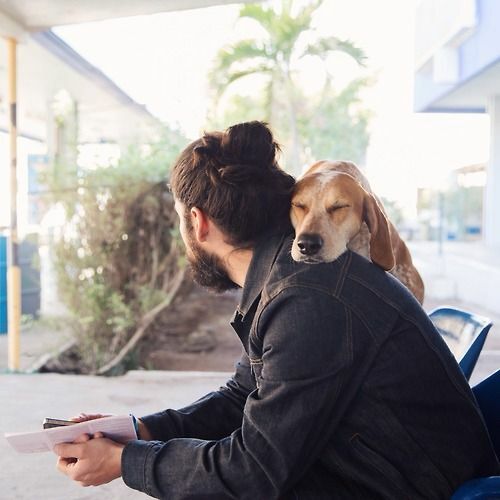 When shelters kill lost pets whose owners are trying to find them and it makes the news, shelter directors often attempt to blame the owner, stating that the pet should have been microchipped. 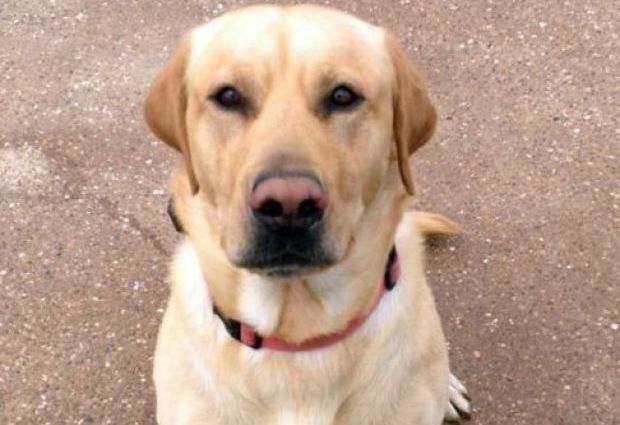 The implication being that if the pet had been chipped, the shelter would have called the contact information associated with the chip before killing the animal and the owner could have had a chance to find out where the pet was while still alive. As if somehow that is in any way a reasonable explanation for why a pet was killed by someone whose job it is to provide shelter to lost pets. At any rate, it’s false. We know that pet killing facilities do not always call to get the contact information associated with a microchip before killing pets. The neutered cattle dog mix was picked up by a Good Sam who found him running loose. 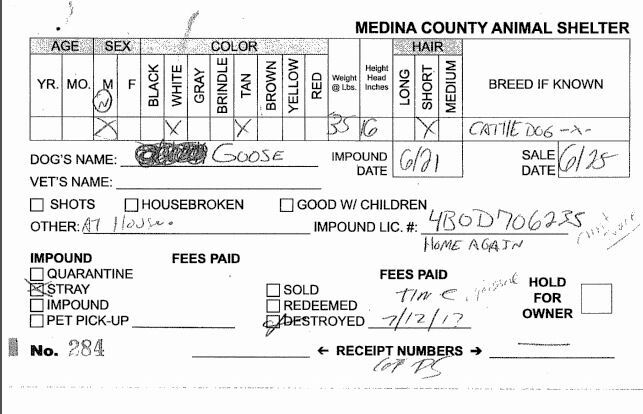 The Medina Co pound clearly scanned the dog for a chip, found it and noted the chip’s manufacturer and ID number on the records. Then they killed the dog, noting they didn’t have “time” to do their jobs and shelter him. There are no records indicating Medina Co ever contacted Home Again to obtain the contact information for anyone associated with the microchip. When I shared this record with an animal advocate in OH, she contacted the chip manufacturer listed and was advised the chip had been implanted by a shelter in OH. She called that shelter and spoke to someone who looked up the chip’s ID number. The chip belonged to a dog named Gambit who had been adopted to a new owner. The new owner apparently did not register the chip in his name. The shelter records for Gambit contained a note that he was an “escape artist”. It seems plausible that Gambit escaped from his new owner’s home and was found by the Good Sam who brought him to the Medina Co pound. The shelter worker who spoke with the advocate said Medina Co had never contacted them about Gambit and if they had, the shelter would have picked him up right away. Many pet owners do not understand how microchips work or the importance of registering them. This is one reason chip manufacturers keep the contact information of the facility where the pet received the chip – so even if the new owner doesn’t follow through with registration, there is still a contact for the pet in case of emergency. But Medina Co apparently couldn’t be bothered to make that phone call. Because they don’t have “time” to do their jobs. Too busy injecting dogs with insufficient amounts of Fatal Plus and gassing cats last summer, I guess. And while it’s understandable that a pet owner might not understand the significance of a microchip, workers at a taxpayer funded animal shelter definitely should. Nobody WANTS to kill animals, except when it takes “time” to save them.